In this paper we will give an overview of our studies on turbulent flow over rough surfaces such as shark skin, which have a drag reducing effect known as shark-skin effect. Our mathematical model is restricted to the flow in the viscous sublayer. Here, the turbulences which occur in the flow above this layer enter through a boundary condition. 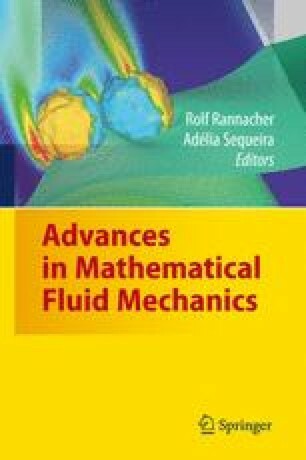 The flow equations are the steady state Navier-Stokes equations with a Couette flow profile given through two boundary conditions: a diagonal flow on the top and the no-slip condition on the rough surface. Direct simulations are performed via stabilized finite elements. For a better approximation of the boundary isoparametric finite elements are used. Our first calculations give a drag reduction of rough surfaces up to 8% whereas 15% is obtained with an improved model. We will discuss this amount of drag reduction and how it can be compared with experimental results. For gaining insight in the details of the flow, how it is influenced by the different shapes of microstructures, and how their drag reducing mechanism can be explained, we used scientific flow visualization. We will present a short overview of the methods employed.